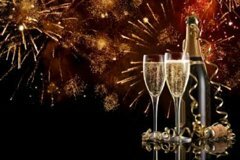 Join Music City Pub Crawl for our annual Resolution New Years Eve pub Crawl. Nashville is the place to be for New Year's Eve, but all the festivities occur later in the day. Our annual pub crawl runs from 3:00pm - 6:00pm so you you can get a jump start on a night of fun but not miss any of the city events. This pub crawl is bigger than our usual crawls, with more emphasis on socializing and less on stories. $15 includes drink specials, swag, souvenir koozie, games/prizes and other surprises. What is your resolution? The Resolution Pub Crawl on New Year's Eve in Nashville is 3 p.m. Check-in begins at 2:30 p.m. at Buffalo's Bar, located at 154 2nd Ave. N. Stop by five bars along historic 2nd Avenue, including Buffalo's, Benchmark, Big Shotz, Doc Hollidays, and Wild Beaver. The event will end at Wild Beaver Saloon at 6 p.m. so you will have the rest of the evening to party. Guests must be 21+ to participate; all bars will card so make sure you have your ID on you. All International guest should bring their passport for ID. Guests will be given a map of bars along 2nd Ave along with featured drink specials. There will be plenty of guides to keep the group moving along.